Create the ultimate growing environment for your crop, cooler by day, warmer at night. Reduce your heating bill by 20 to 50%! Reduce air temperature fluctuations by insulating from cold in winter and reflecting heat in summer. Reduce plant leaf temperatures by 5?C during the day. Increase plant leaf temperatures by 5?C at night. Control humidity day and night. Create a more comfortable working environment. Push-Pull and Cable driven mechanisms available, a solution for every greenhouse. 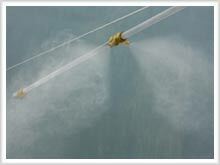 We use industry standard designs in wide use internationally. Top quality reflective energy screen materials- The Fifth Season. Energy Saving . Heat losses are reduced by the screen acting as a barrier to convective heat losses. Constructed of 4mm wide clear polyester strips woven together with polyester filament yarns. This material is breathable, allowing water vapour to pass through. Energy savings of 40% or more. Energy Saving Solar Reflecting Similar construction to an Energy Saving screen, but with 4mm wide polyester backed aluminium strips alternating with the clear polyester strips. The aluminium strips serve a double purpose: they reflect a portion of the suns rays reducing the greenhouse air temperature, and they reflect a portion of the radiant heat losses at night thus reducing the heating cost. Energy savings of 45 to 70%. Cooling a Hot Greenhouse On hot, clear days with little or no wind, even the best ventilated Greenhouse will require more cooling than can be achieved with natural ventilation alone. Many growers opt to reduce the light transmission of their covering materials by painting them with white wash- a time consuming, messy job. But what happens when you have a period of overcast weather during summer? Light levels are reduced to a point where plant growth is compromised, and there is no easy way of removing the whitewash. Other growers use ordinary shade cloth inside the greenhouse. Whilst this will help to reduce plant leaf temperatures, it cannot reduce the greenhouse air temperature- in fact, it can increase it! It is important to note that the suns rays do not directly heat the air in the greenhouse. Solar radiation passes through the covering material and air without giving off heat energy. When any non-reflective internal surfaces are struck by solar radiation, they absorb the energy and become heated. The Greenhouse air is then heated by convective heat transfer where it comes into contact with the heated surfaces. If a grower opts to use a traditional shade cloth, the cloth will heat up in the sun and actually make the greenhouse hotter! If a portion of the incoming solar radiation is reflected back though the cover, it will leave the greenhouse without heating the air, so the greenhouse will become cooler. This is the principle on which Solar Reflecting Energy Screens work. 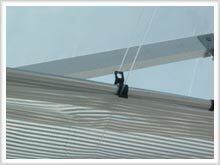 The 4mm aluminium strips reflect a portion of the incoming solar radiation, thus providing a cooling and shading effect. So the air temperature will drop, as will the leaf temperature. If an open weave screen is used in conjunction with a fogging system placed beneath the vents, you will gain total control of your greenhouse environment. The winter heating bill is one of the growers most significant costs. The beauty of an energy screen is that it benefits your greenhouse all year round. As described above, all three types of Energy Screen Material offer an energy saving in winter. Even an open weave material will save you 20 to 35% of your current heating bill- that is a significant saving. A 50% saving is easily achievable with the right Energy Screen Material. Based on the winter heating bill alone, how long will it take for this investment to pay for itself, not taking into account your increased quality and productivity due to the year round fine control you have over air temperature, humidity, leaf temperature and light levels? Contact us for an obligation free quote and find out!